Looking for clutter-free gift ideas for the people on your list this year? 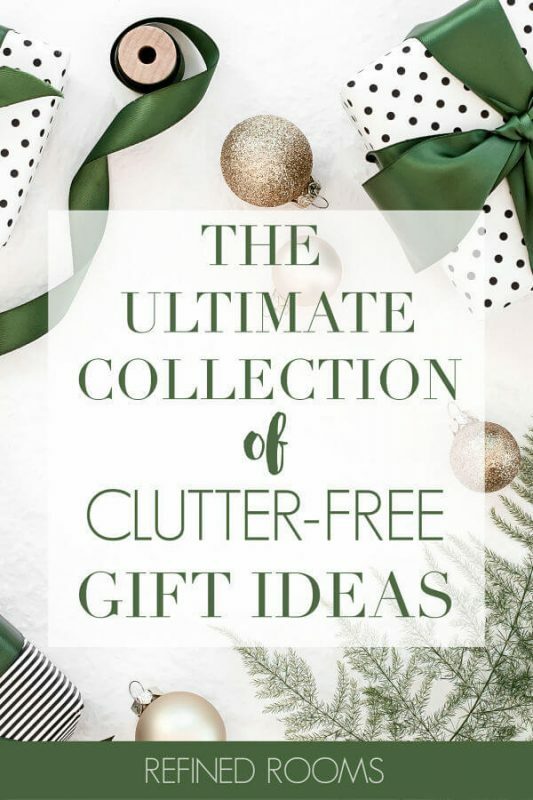 Download this Ultimate Clutter Free Gift Guide! During my days as a professional organizer, I regularly found myself giving clients permission to let go of items that they have been holding onto simply because they were given the item as a gift. These are things that the client did not need, use or want…things that were taking up valuable space in their home because of a misplaced sense of obligation to the gift giver. Don’t burden people with a gift that could likely end up in the “donations” box or the “re-gift” shelf of the bedroom closet. Need more convincing that gift clutter is a problem? Take a look at the results of a recent survey conducted by the folks at Sparefoot. 79 percent of the U.S. population (89 percent of millennials) say they never use some of the gifts they receive each year. On average, more than one in four gifts go unused! You can avoid the potential of adding to someone’s clutter pile by giving a “clutter-free” gift–a gift that is not a THING and doesn’t occupy space in the gift recipient’s home. The professional organizing blogosphere is overflowing with posts that celebrate clutter-free gift giving. Just check out this Professional Organizer’s Blog Carnival if you don’t believe me! There are countless clutter-free gift guides out there, so I thought I’d throw my hat into the ring and offer up some clutter-free gift ideas that will hopefully provide some direction if you are stuck on what to give that certain someone this year. 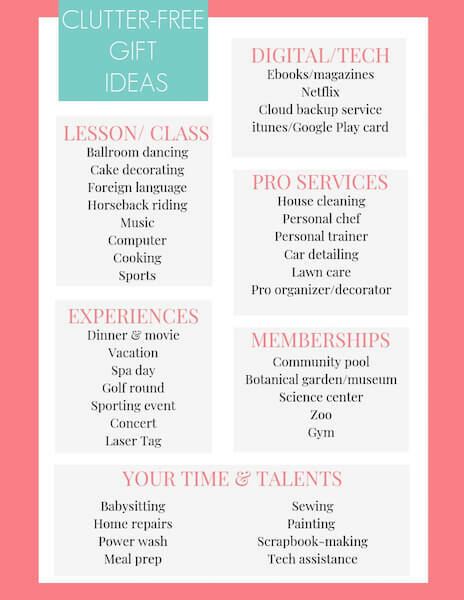 Download a printable version of this ultimate list of clutter-free gift ideas at the end of the post! Click on the image below to download this clutter-free gift guide for future reference! What are YOUR favorite ideas for clutter-free gift giving? What have I missed? My parents always give us a zoo membership and it’s a gift that keeps giving all year long. Plus we get to go to special events at the zoo. Thanks for sharing at Merry Monday! Ah, the zoo membership! We used ours frequently when the kiddos were little. That’s a great example of a useful clutter-free gift! Thanks Jenny!